Lynn and Ralph have contributed to many GoFundMe accounts in times of tragedy, And unfortunately, it is they who are now in need. 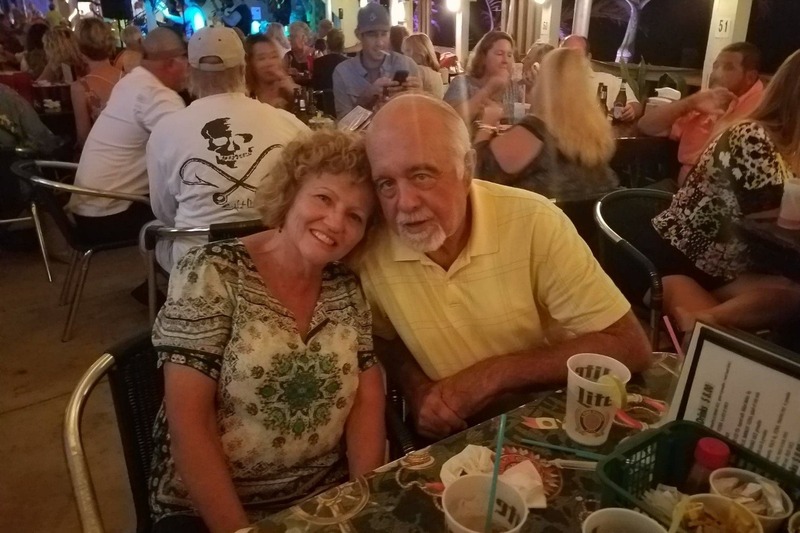 On Thursday, August 9th, 2018 and while on vacation in Hawaii, Ralph was hit by a rogue wave, tossed and slammed in the surf, and knocked unconscious. Thankfully, bystanders pulled him to shore, where he regained consciousness, but he suffered a serious abrasion to his head and trauma to his neck and spine. He was taken by ambulance to the local hospital to be stabilized and then airlifted to Queens Medical Center in Honolulu and their Neurological Trauma Center ICU, where he remains today. On August 12th, the neurosurgeon surgically implanted screws in his C3 - C6 vertebrae to stabilize the neck. He's currently on a ventilator, but they hope to be able to wean him off that as his breathing improves. Each day, we rejoice in small improvements in his condition. We don't know when he will be able to be moved, but after discharge, Ralph will need months of physical therapy and may never regain full use of his arms and legs. Thankfully, he suffered no damage to his brain, and he remains the Ralph that we all know and love. Being so far away from family and home during this time is hard on them and it may be weeks, or even months, before he can be moved. Lynn is hoping to stay in Honolulu to be with Ralph and keep his spirits up, but that will be an expense that is not covered by insurance. Lynn has been staying at a reasonably priced hotel nearby and walking to and from the hospital, but it's not safe to walk at night and even using Uber, the expenses are adding up quickly. If you can donate, whatever amount you can will help defray the expenses for Lynn to stay with Ralph, and then whatever medical expenses for Ralph that are not covered by insurance (transportation back to the mainland for rehab and then back to their beloved home in Florida, home modifications required for wheelchair access, and things we haven't even considered yet). It will be a long road ahead and we appreciate any and all help that you can give, including prayers. For more information, please contact either Lynn's sister Noranne at noranneo@yahoo.com or Ralph's sister Carol Lanigan LaMarr at carol.lamarr@hotmail.com. It’s hard to believe it’s already March, but here we are. Ralph continues to work hard every day with his therapies, and continues to make progress…but these things definitely take time. The bedsore – The bedsore has made good progress with healthy tissue growth and “granularity”. Wound surgeons from Mass General Hospital have been consulting every couple of weeks with the Spaulding team. A decision will soon be made whether to close it surgically or continue to wait for it to close on its own, but it could still take another 1-2 months. Lynn’s sister Carol has been helping, and is acting as Ralph’s personal chef. She’s brought him scallops, swordfish, beef stroganoff, etc. – high protein to help the bedsore heal – and foods that he loves. Physical Therapy – From last month’s goal, Physical Therapy did have him standing between the two parallel bars, with special gloves that help him grip. He also has been working on the pedaling machine…with both his hands and his feet. He spent some time on the “Frankenstein table”…it’s a tilt table that they strap him into and then tilt it up into a standing position. This will continue to strengthen his legs and his balance. He can withstand it for 30 minutes, and they do this about once a week. They also put him on a muscle relaxer, Baclofen, to help him ramp up his therapies. He is making additional progress with his fingers, core muscles, etc. Andrew, his Physical Therapist, sees a difference in that it used to take him 10 minutes of warm up to do a stretch, now he goes right into it and further than before. Occupational Therapy – They’ve been doing a lot of stretching and using the E-stims on his hands. They may have to use a special fork that wraps around his hand in order for him to feed himself. He was able to sign his annual Mass. Teacher’s Retirement form…with minor help from Krista, his Occupational Therapist, and an elastic band to help with his grip. Surprising everyone, It was perfect and legible. Respiratory - His body is unable to expel the CO2 sufficiently right now, so they’ve put him back on the ventilator through his trach at night (only). Hopefully, as his strength improves, he will have the trach removed and just have to use a Bi-Pap machine at night (similar to a C-Pap, which people with sleep apnea use). Lately, he’s been battling some kind of infection…hard to avoid when you’ve been hospitalized for 7 months. His doctor said his system is compromised because of his injury, lung weakness and also being in the hospital for so long. It hasn't stopped his therapy workouts and actually, they have gotten more intense. As a result, his muscles are not as tight, giving him more flexibility and mobility. Recently he’s experienced some pain and swelling in his right ankle. They’re not sure yet if it’s related to his arthritis, or overextension from therapy, or even gout. They did an x-ray on 3/18/19. Again, we are so appreciative of all the cards, donations, prayers and continual gestures of support. Ralph definitely feels the love and support around him and wants to make you all proud. We also send a special thank you to those who have made special food for Ralph (and Lynn). Special thanks to Ann Quinn and Paula and Chuck Coyne for sharing their culinary talents! We truly appreciate everything you all do to help. Ralph continues to make progress. He is working hard with both Physical and Occupational therapies. He has strengthened his legs enough to get strapped into a stationary bicycle and can reach up to 40 mph with his pedaling. “Standing with support” was a goal last month; a reality now. Next goal is standing between parallel bars, using his arms to support his weight. Ralph continues to work at strengthening his core muscles and they are ramping up his therapies. He works with Occupational Therapy to strengthen his arms and hands. He can now lift his left arm and hand and they continue to work with his fingers. His right hand is also improving. He can now pinch his right thumb and pointer finger together. He also continues his therapy exercises while he is watching TV, or any downtime that he has. We had a follow-up meeting with his Spaulding Wound Care Team and doctors from Mass General Hospital regarding his bedsore. The bedsore is his most challenging obstacle. The MGH surgeon feels it is healing – slowly, and we should “stay the course”. There is a strong need to keep his protein intake at maximum levels to aid in healing the bedsore. This week, we brought in broiled scallops and broiled swordfish, which he loved! Before she left to go back to Florida, Noranne made him bison meatloaf, which he enjoyed. The days are busy with therapies and doctors, but the nights are too long and too quiet. We have ordered a refurbished iPad to improve the quality of his nightlife. He will be able to watch his beloved sports (specifically tennis and the Celtics) and movies. Once again, thank you all for your donations, support, love, words of encouragement, cards and prayers. It means so much to all of us! When we arrived in Boston, Ralph had set an expectation with himself that he would be home in Florida by Christmas. That didn’t happen because of the bedsore, so his birthday and Christmas were a little sad. But we push forward. The bedsore IS healing, but it heals from the inside out and that takes time. It could be another month or two before it’s healed enough to get back to full time therapy. He continues to make progress with his therapies, and the speech therapist has even signed off that he can have any kind of food and 3 meals a day and that she doesn’t need to see him anymore! We often bring him food from home, and he definitely prefers that over the hospital food. Noranne made his mother’s Portuguese Soup recipe for his birthday, and Carol (Sister in Law) and Renee Marshall (niece) made him a Boston Cream Pie. In fact, we have a very special treat for him today. We are bringing him prime rib, mashed potatoes and carrots for lunch. Occupational Therapy and Physical Therapy are working him hard, driving the motorized wheelchair around the 3rd floor, standing in the EZ-Stander for 10-minute stretches, pedaling on the bike machine, and doing lots of stretching. They continue to use the E-Stims (electric stimulators) on his hands, as well as gloves with Velcro that keep his hand in a fist position for a few hours at a time to stretch the fingers. His core muscles are fairly strong and getting stronger. When they have him sitting on the bench in the gym and pull him forward, he can pull back and stabilize his torso from side to side. As for pulmonary, the trach is capped for 24 hours now, so he’s breathing on his own, with a little help of oxygen from time to time. This week, they determined that the CO2 levels in his blood are too high, so they’re working on a remedy for that. The visit with his grandsons was very emotional for everyone. It’s hard for Ralph, a natural entertainer, to not be in a position where he’s moving around and keeping everyone happy. And it’s hard for people to see him lying in bed without the full use of his arms and hands and legs. He has started to allow a couple of visitors. But it’s very exhausting for him, so please be patient. Lynn spends every day with Ralph and after 4 ½ months, she finally took a day off and went for a drive down to the Cape with Kyle and his family. Noranne spent the day with Ralph (helping him with his lunch, getting ice and lemonade, changing the TV channel, etc. ), but he missed Lynn. Lynn and Ralph are so very appreciative of all of your continued support. They loved the Christmas cards, Get Well cards, donations to the account and the prayers. We all acknowledge every day how lucky we are to have such caring friends and family. Today, Kyle and Carolyn brought Cameron, Colin, and Cole to see their Papa. It was an emotional visit, but a happy one for all. Lynn and Ralph want to thank everyone for the cards, and especially those who have sent multiple cards. We read each card to him and show him them, and he really enjoys them. We also want to thank those who have contributed to the Go Fund Me account. Your generosity has really touched us and we are very grateful.